Latest lighting endeavor | So Pretty is as Pretty Does. You can find the instructions for the entire project here, Ready Made’s Glass Act. 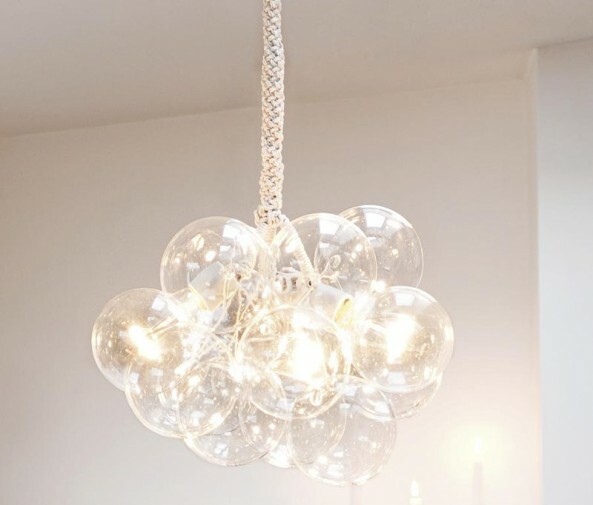 I think it’s going to work well in my smallish dining room, where I didn’t want something big and visually heavy, but I still wanted a chandelier. Plus, it reminds me of champagne, and that can’t be a bad thing! ← I’ve heard this since I was a child. LOVE this! The instructions make it sound so easy. I will definitely have to try! Hi Seabrook! I’ll definitely follow-up once I’ve made mine and add to the instructions if needed. Thanks! This is gorgeous and inspired – I’ve been looking for something eye-catching for my hallway. Thank you! I think this would be stunning in most any space, and since it’s a DIY you can make it bigger or smaller depending on the size of your hallway. Good luck! From Hoarder to Order | So pretty is as pretty does.